To withstand the tough conditions of the construction site, these units are made from Clarino synthetic leather. While the material is tough, it’s soft and comfortable thus ensuring that you are comfortable the entire day. The material is also resistant to stretching, hardening, and shrinking. This ensures that the gloves last for a long time. As a construction worker, the last thing you want is to waste time putting on and removing the gloves. These units have a wing closing strap that makes it easy for you to adjust them to your liking. For flexibility and fit, the gloves have a stretch spandex. The knuckle area of the gloves is padded thus ensuring that you are as comfortable as possible when working. The padding also comes in handy in lengthening the lifespan of the gloves. Almost everyone works with a mobile phone at the construction site. To ensure that you have an easy time while wearing the gloves, these units have three touchscreen fingertips. At the time of writing this review, the work gloves had over 2, 800 reviews and a 4.1 score. There are a few customers that were unsatisfied with the gloves. One of the customers complained that the fingers were too thin. This is usually due to buying the wrong size. Others complained that the gloves ripped after one or two uses. This is due to manufacturing problems. While the gloves had minor issues, they are great, and you can’t go wrong with them as a construction worker. Made by Mechanic wear, these gloves are made from high-quality leather; therefore, you can be sure that they will last for a long time. The gloves also have a dual inner layer. The reason you will be wearing the units is that you want them to protect you from the harsh conditions of the construction site. These gloves do that. They feature a thermoplastic rubber knuckle and finger guards that protect you against the impact. For your comfort, the gloves have a D30 palm padding that absorbs and dissipates high-impact energy. The units also have a dense TPR closure that protects you from the impact. The feature also protects you from abrasion while at the same time providing you with a comfortable fit to your wrist. The units also feature a breathable TrekDry that conforms to the back of your hands which comes in handy in keeping you cool and comfortable at the construction site. 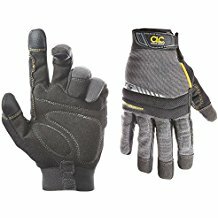 At the time of writing this review, the work gloves had over 900 reviews and 4.6 stars out of the possible 5. From the rating, you can see that many customers love them. Most of the customers were satisfied with the gloves, but a few of them had complaints. The unsatisfied customers complained about the size. To avoid being disappointed, take the measurements of your hand before making the purchase. They are made from a blend of cotton and rubber that is coated with blue latex that provides extra durability. On first look, you might have the impression that they won’t give you the right protection but this isn’t the case. The thick latex coating provides you with top-notch protection that ensures that you are comfortable when working. 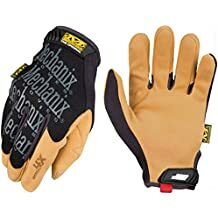 Since they are made from cotton and rubber, you don’t have to worry about them scratching you—they will be very comfortable thus ensuring that you are productive at the construction site. The units are also light thus you don’t feel burdened when working. At the time of writing this review, the work gloves had over 490 reviews and a 4.6 score. While the units had many positive reviews. There are some customers that complained that the gloves were thicker than normal. It’s good that you note that they are thicker as they aren’t made from leather like the other gloves. You shouldn’t overlook these gloves. They might even be better than the leather work gloves that you are used to. The gloves are made from high-quality grain cowhide; therefore, you can work with peace of mind knowing that your hands are fully protected from abrasion and punctures. To have an easy time finding the right fit for you, the gloves have a ball and tape wrist closure. The closure also prevents debris and dirt from getting into the glove. To provide you with comfort when working, these gloves have reinforced leather patches. They also have a Gunn cut that places the seam of the glove at the natural crease of your hand. The comfort is further exaggerated by the keystone thumb design. The gloves are light making your work easier. 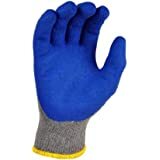 At the time of writing this review, the work gloves had over 564 reviews and a 4.3-star rating out of the possible 5. Most of the reviews were positive such as: “Good solid work gloves,” “some of the best fitting work gloves,” “resist briars, burns, and blisters,” “very good quality leather gloves and glad I purchased them,” and many others. The few customers that weren’t happy with them complained that they were too large or small for them. To avoid this, you should take your time and order those of the right size. They are made by mechanix which is one of the most reputable companies in the construction of work gear. The units are made from a form-fitting TrekDry material that keeps the hands cool and comfortable. To keep them from falling off, the gloves feature a thermal plastic rubber closure with a hook and loop. To ensure that the gloves are as durable as possible, the units have reinforcement panels in the high wear areas such as the knuckles and arm. The units also have a seamless microfiber that delivers higher abrasion resistance and greater tear resistance. When it comes to cleaning, the units are machine washable thus making your work easy. At the time of writing this review, the work gloves had over 200 reviews and an average rating of 4.5 stars. From the ratings, you can tell that most of the customers were satisfied with their purchases. 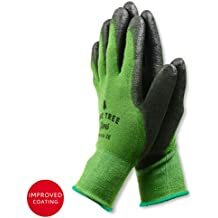 Some of the positive reviews that the customers left include, “best work gloves out there,” “great gloves-Great fit,” “tough and durable,” “love these gloves,” and many others. While most of the people were satisfied with their purchase, a few of them complained that they didn’t last as much as they wanted to. As mentioned above, the durability of the gloves depends on how you use and store them. Do you have sensitive hands? You should go for these units. They are made from breathable bamboo that keeps your hands cool. While they are made from bamboo, they are tough thus they can withstand the tough nature of the construction site. In addition to being insensitive to your hands, the units are also very comfortable to wear. When you wear them, they fit you like a second skin. If you love conserving the environment, these are the go-to units as bamboo is a renewable resource. The gloves are very light. In fact, you can work on your projects without realizing that you are wearing them. At the time of writing this review, the gloves had over 1,500 reviews and a 4.6-star rating. The units had many positive feedbacks such as: “excellent value for a very flexible glove,” “nice fit,” “Exactly as described. Nice gloves, great price,” and many others. While the majority of the reviews were positive, some people were unsatisfied with them. The common complaint is that the gloves didn’t last for a long time as expected. It’s good to note that how long the units last depends on how you use and how well you take good care of them. They are made from 100% nylon that provides maximum flexibility in both dry and wet environments. The units also feature a breathable nitrile coating that makes them very comfortable to wear. For high dexterity and flexibility, the units have a seamless fit. The cool thing is that they are ergonomically designed to provide a superior fit and feel thus you are comfortable when working. At the time of writing this review, the gloves had over 1,500 reviews and 4.5 stars out of the possible 5. The unit had many positive reviews such as, “I love these gloves! 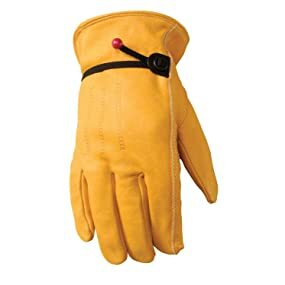 !,” “tough gloves,” “best garden gloves,” and many others. While most of the people had positive experiences with the units, others had a number of complaints. The most common complaint is that they were too small or too large. This comes about when you buy the wrong units. To avoid this mistake, take your time to measure the size of your hands so that you can order the right units. Hazards: What are the hazards at the work site? This will help you in choosing the right gloves to buy. For example, if you will be lifting stones at the site, you will need tough units that can withstand the wear and tear. If you will be interacting with chemicals at the site, go for units that can’t be damaged by the chemicals. Other hazards at the job site that you need to pay attention to include: oils, cuts, scrapes, bacteria, viruses, electrical currents, and extreme temperatures. If you aren’t sure of the right units to go for, get the input of a professional. Fitting: This is how well the gloves are fitting. If you buy gloves that are too large for your hands, you will have challenges at the workplace as the units will keep on coming off. On the other hand, if you wear safety gloves that are too small, you will have a restricted range of motion, which will also prevent you from getting the work done. In some cases, you might have injuries such as blisters. You also might hurt yourself working, especially when you work with gloves that are too large. To be on the safe side, take your time find the right gloves for your hands. When buying the units from your local store, don’t shy away from trying them on and settle on those that fit you perfectly. If buying the units online, take the measurements of your hands. You need to take the measurements of the hand length. This is the distance from the tip of the middle finger to the large crease where the palm meets the wrist. You also should take the measurements of the hand width—the circumference of the hand around the widest part of the knuckles. When making the measurements, remember to include the thumb. Coating: Coatings are often put in place to increase the comfort of the gloves. The coating also aids in protecting you from certain elements. For example, if you will be working with chemicals at the workplace, you need units with an impermeable protective coating that will prevent the chemicals from passing through. If you will be working with sharp objects such as needles and cutting tools, go for units with a hard backing that won’t puncture. Material: Work gloves are made from a wide range of materials with the most common being: latex, metal mesh, cotton, and leather. You only need to choose the material that is ideal for your work site. Most people are allergic to latex; therefore, you should be cautious when making the purchase. If you struggle with allergies, consider undertaking an allergy test. When you are buying many products, you will hear that quality and low price don’t go together, but this doesn’t mean that you can’t get good quality units at a low price. Choose the features that you need: When you are making the purchase, you should go for the features of interest. This will depend on the work that you are involved in. For example, if you work in the gas and oil industry, you should go for a glove with Hi-viz backing that will make you aware of the area you have placed your hand. You also should ensure that the glove has a thermoplastic rubber across the fingers, around the wrist area, and back of the hand to protect you from the impact. Go for a good quality, cheaper materials: When you ask many people about work gloves, they will point you towards leather gloves. If you have bought the gloves before, you must know that they don’t come cheap. It’s good to know that there are other cheaper materials such as string-knit gloves that work almost as good as leather. In addition to being cheaper, these units also have many other positives. For example, they are knitted to the shape of your hand; thus you are comfortable when handling your construction materials. For high cut resistance without losing dexterity, some of the units are made of fiberglass cores or steel. The units are also more breathable than leather. Avoid buying different types of gloves for the same purpose: This comes about when you don’t do your research and end up buying more gloves than you need. This results in you spending a lot of money. To be on the safe side, do your research and find gloves that can do more than one task. 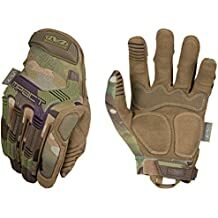 Take good care of the gloves: Just like any other units you might be having, when you take good care of your work gloves you prevent them from getting damaged; thus they last for a long time. As a result, you don’t have to worry about replacing them regularly. Use them in the right area: As mentioned above, different work gloves are designed for different roles. Since using the wrong gloves for the wrong work would result in damage, use the right gloves for the right application. For example, you shouldn’t use gloves designed for use in a chemically intoxicated environment to move bricks. Regularly clean the gloves: Another thing you need to do is to clean the gloves periodically. When cleaning the units, you should note that some of them can withstand the rigors of laundering better than others. For example, you can commercially clean string, cotton, and leather gloves without worrying about them shrinking. If you are using synthetic or unsupported work gloves, be careful when cleaning them as you can destroy them in the process. The best way of cleaning the gloves is washing them in running water while wearing them. This not only ensures that the gloves are spotless, but it also prevents them from permeation and slow contamination. You should avoid using any cleaning solvents as some of them have been shown to react with some of the glove materials. You should only use the solvents if the available water is inadequate. 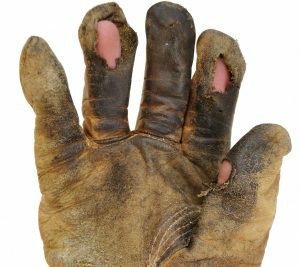 Regularly inspect the work gloves: In addition to regularly cleaning the units, you also need to inspect them for defects that they might be having regularly. By undertaking regular inspection, you can identify even the most minor issues and fix them before they get worse. Store the pieces properly: When you aren’t wearing the gloves you need to store them properly. The best place to store them in in well-ventilated bins at normal room temperature. Ensure that you place them away from direct sunlight. 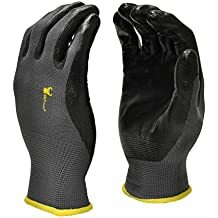 This is a detailed guide on how to buy the best work gloves for construction and how to take good care of the units that you buy. To get the most from the units, buy them from a reputable supplier. You also should regularly clean and inspect them for any defects they might be having.